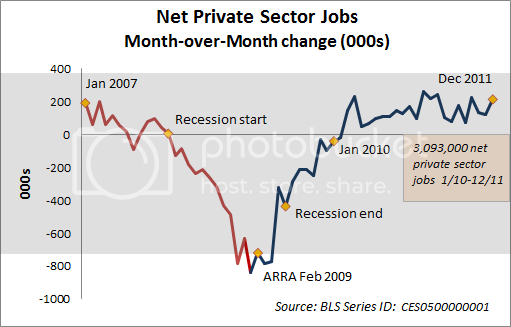 Here’s the factual record on economic growth and private sector job growth. In both cases, the graph displays the data points from the beginning of January 2007, showing the run-up to the Recession, followed by the enactment of the Recovery Act and the subsequent recovery through December 2011. As the historical record clearly shows, the economy has rebounded to pre-recession levels in both economic output and private sector job growth. 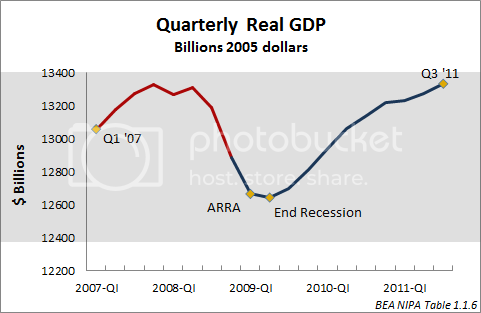 Since NBER declared an end to the Recession (June 2009), the economy restored almost 700 billion in real GDP and has added a net 1,992,000 private sector jobs. Moreover, from January 2010 through December 2011, the business sector has generated net job growth of over 3,000,000 jobs. The partisan rhetoric simply doesn’t match the record. Harry Reid announced on Wednesday (Oct. 5) that the Senate would take up Jobs Act legislation (S. 1549) soon, but that the offsets in the president’s proposals would be replaced by a 5% surtax on those making more than a million that would raise about $445 million. See Bolen & Lorenzo, Senate to Debate Jobs Bill Paid For with 5% Millionaire Surtax, BNA Daily Tax Report 194 DTR G-7 (Oct 5, 2011). Not surprisingly, GOP senator Hatch complained that this small surcharge on millionaires would be a “massive” tax increase on “small businesses”. Id. How many times do we have to remind Congress that most small businesses don’t make millions in profits, that those who have millions can pay a 5% tax without undue distress (compared to those with a ten dollar bill being able to support their family with food and shelter), and that 5% of $1 million is not a “massive” tax increase. 50% of $1 million might be, but 5% is simply not.